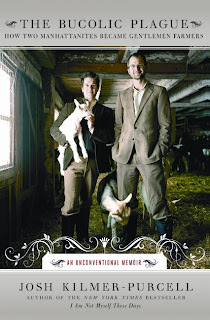 The Bucolic Plague: How Two Manhattanites Became Gentlemen Farmers is a somewhat misleading title. Yes, it's about a gay couple in New York that buys a rural mansion, but it's not so much about the farming as it is about relationships and the pursuit of perfection. Josh Kilmer-Purcell is a former drug addicted drag queen (he brings this up multiple times in the narrative, though I am not sure how it was particularly relevant) turned ad executive. His partner, Brent, is an MD/MBA who works for Martha Stewart. On their way home from apple picking, they come across the beautiful Beekman mansion in Sharon Springs, NY and impulsively purchase it. Then they hire a caretaker to raise his goats there. They plant a large vegetable garden, have guests over and set about living the dream- city living during the week and relaxing on a farm on the weekends. Perfect! Josh soon wants to quit his job and live full-time on the farm, and they set about making this dream a reality. Except, they soon come to find, making dreams reality takes a lot of work and can be exhausting, and as the economy collapses around them, Josh wonders if it's a worthwhile endeavor. I have read a few books lately that were different than I expected but pleased me, anyway. This is one of those books. I was expecting something along the lines of all the local food movement books out recently, about going back to a more simple and physical life than that offered by urban living. That is not what this book covers, though. In fact, Kilmer-Purcell seems to have no trouble at all with his garden; he seems to grow a bounteous harvest from the start. (No doubt due to his Wisconsin upbringing.) And he doesn't spend much time talking about the actual restoration of his fabulous mansion or raising 80 goats or how he managed to grow so many amazing vegetables. Instead, he talks about Martha Stewart. But not only about Martha Stewart. He also talks about Oprah. And it is like those posters you see sometimes, "All I need to know in life I learned from Martha and Oprah." Except that the ideals Martha and Oprah espouse are not real for most people. And that's the trouble. Brent and Josh try to make a living off their farm by selling goat's milk soap. They also have a blog and are now in a reality TV series. But the blog only shows beautiful pictures of finished products and perfect fruit and an idealized bucolic lifestyle. That's not how life really is. Sometimes fruit is bruised and sometimes pies burn and sometimes, a weekend consists solely of cleaning the chicken coop. But no one ever wants to show that side to the world. And why is that? At one point in the story, Josh describes spending an entire day taking pictures of his pie-making process. Ordinarily, it would only take him a few hours to make a pie, but this time, it took forever as he photo-documented the process. And then he put it in the oven and forgot about it. It came out burned. Instead of posting this picture and saying that he burned the pie, he just didn't post period. Not one picture from his whole day's work. Just because his pie was burned. Josh is not the first person to ever burn a pie, nor will he be the last. He could, however, have just shared that story with everyone on his blog and created a more personal "Hey, I take spectacular pictures and post them on my impressive website documenting the travails of mansion living, but I'm human, too." But he didn't. And so the moment was lost. This upsets me in many ways. Based on her show and her books and her magazine, one gets the impression that Martha Stewart has never in her life made any sort of mistake, and that her whole life is citrus-scented perfection. But she's not perfect. She's probably burned a pie, too. And by constantly leaving out life's out-takes and pursuing this ridiculous idea of perfection, she probably has few friends and has made food seem more like artwork than sustenance. Food should not be intimidating. It is for imbibing, and enjoying, and coming together. Trial and error. And I hate the way that now, people act as though mistakes are not learning opportunities. As though you can't say, "Well, I messed up my pie, so here's what I whipped together last-minute from whatever I had in my kitchen instead." Because God forbid anyone "whips up" anything that doesn't take hours to create. I have moved away from reviewing the book now, and I don't think I will go back to doing so. Much like The King's English made me reconsider the way I spend my money on books, The Bucolic Plague made me think long and hard about our pursuit of ideals- in food, in love and in life- and how it constantly sets us up for failure and disappointment. Josh went from being a successful man with a long-term relationship and a generally happy outlook to being over-stressed, isolated and depressed. There is a section in which he puts bird netting over his cherry tree so that his cherries stay perfect (even though they are only baking cherries and it doesn't matter how they look). And then, when he takes the netting down, he is horrified to find that it has killed over a dozen birds that got stuck in it. All so that he could have picturesque fruit. That's the Martha side. The Oprah side is about dropping everything to pursue what you think is Your Best Life- but who knows if that life will be successful? Is it worth all the stress and living paycheck-to-paycheck to be a "gentleman farmer" when instead, you were quite comfortable on your ad exec salary? Isn't Oprah's "live to the fullest" approach just as unattainable as Martha's "perfection at any price" one? And don't they both cause a great deal of harm? The Bucolic Plague tackles all these questions in a humorous and reflective manner. I really enjoyed this book and its hard, honest look at relationships and the pursuit of dreams. So much so that I may find it in myself to forgive Kilmer-Purcell for his unkind (and absolutely false) words on the glorious city of Chicago. "And I hate the way that now, people act as though mistakes are not learning opportunities. As though you can't say, "Well, I messed up my pie, so here's what I whipped together last-minute from whatever I had in my kitchen instead." Because God forbid anyone "whips up" anything that doesn't take hours to create." SO true. I loved this review and all the points you made here, Aarti. And the book sounds great, though in a completely different way than I'd have imagined too. I can't say I want to read this book, but I loved your post Aarti! My fibro has made me have to compromise my inner perfectionist a lot, and while it's a struggle, I'm gentler with myself than I used to be. Don't get me started on the Oprah 'live your real life' thing. It implies that if we don't absolutely adore going to work every morning, we're not being fulfilled human beings, which strikes me as a load of hooey. Amazing, amazing review. I absolutely loved it. I have this book to review and want to read it, if only just to see what I'll think about it and if I will have the same reservations as you. Thanks for making me think! Nymeth- Thank you! One of my friends is a food photographer, and her blog has really pretty pictures, but she is very honest about how food tastes and looks when she cooks it, and I find that very refreshing. I also think it's more USEFUL to tell people how to put together something last-minute, in a scramble. Amy- I don't think your comment is unoriginal at all. I am glad I am not the only one who is tired of the airbrushed way magazines/websites/television shows present life. Eva- I think your comment about being gentler with yourself pretty much hits it right on the head. I feel like all of us are so obsessed with being PERFECTLY happy that maybe we just end up more miserable than we otherwise would, if we didn't have all these ideals in front of us. Swapna- I am SO interested to hear what you think! I hope you read and review it soon so that we can discuss. I know you also enjoy cooking, so I look forward to your reaction to the way these two cook their meals. I have been dying to read this book (and I own it) -- now I can't wait. As I said somewhere else, one of my nephews worked (briefly) for Martha, so I have heard a few Martha stories. And this had me laughing "Because God forbid anyone "whips up" anything that doesn't take hours to create." But wait, before you can make that dinner, you first have to grow it, weave the tablecloth, sew the napkins, throw the pottery, pound out the stainless steel, and blow the glass. Oh and I guess you have to cut down some trees and handcraft the table and chairs. Then and only then can you actually start to cook (for thirty zillion hours). Oh and if the kitchen walls don't match your food, you'd better mix up your own milk paint and get to work. I don't follow Martha and Oprah at all b/c they definitely would make me feel I'm not living My Best Life. most of my life is "throw some thing together and see what comes out". Great review tho I'll probably skip the book as I think these guys would annoy me :) yay for imperfections! This is a phenomenal review of a book that I have to review as well. I cannot wait to delve into it now. Wow. I love books that make me reassess life and question those "perfect" lives on the television -- not that I don't already. I'm a perfectionist and I often find that life has a way of making me realize that perfection is unattainable, though it doesn't stop me from trying -- though in a less stressful way. Since I heard you mention you were reading this, I have been really curious about it. It sounds like it's the polar opposite of Coop, the book I recently read. I am not sure if this book would annoy me or entertain me, but I do find the idea of attaining perfection in all you do a little offputting. Like the story you mention about the pie and the cherries, I don't see why the author couldn't just admit to being a little more human and a little less perfect. I still think the story sounds interesting, just not what I was expecting (which also sounds like your reaction to it). I can't imagine trying to live my life according to Oprah or Martha. It would probably give me a heart attack! Very impressive review, Aarti! I really liked that you digressed a bit. Aarti, I'm certainly curious enough to look for the book after reading your review! Sounds like a fantastic book club selection - so much to talk about. Ooh, you made me even more interested to read this (other than the fact he evidently denigrates Chicago! I'm not sure I'll be as forgiving as you are on that...). Fabulous, thoughtful review. Beth F- Such a good point! I have also noticed with a lot of food photography that the backgrounds match the food! It's crazy! I can *somewhat* understand plates matching the food as it's possible to have many random types of plates/bowls, etc. But setting food in matching surroundings seems a bit excessive to me. Your rant is completely justified, in my opinion. bookmagic- I think MOST people's lives is "throw something together and see what comes out"! I wish there was more of THAT to be found. Serena- I am really looking forward to your review! I think there's a difference between striving to be your best & accepting failure and just pretending that the bad things didn't happen by not mentioning them. Zibilee- I didn't realize Coop was so different! Though at the time I made that comment, I had yet to read this book so I suppose it's quite likely I'd be a little off in my thoughts. I actually think you would like this book a lot. Mary- I'm glad to have piqued your interest! I never thought of it as a book club selection, but you're right, it could be quite good! Jen- Yes, it was hard for me to stomach the Chicago hate. It was particularly harsh coming from a Midwesterner, but the author moved to New York from Wisconsin and I find that transplanted New Yorkers are often the most stringent "No city by NYC" people. Great review, Aarti! I have been known to be perfectionist, so I think I could benefit from reading this book! Brilliant review, Aarti. You've made so many good points here. This isn't the type of book I would normally be drawn to (celebrities/famous people), but you and Lisa from Alive on the Shelves have me curious about it. This is another one of those books high atop my wishlist, and I can't waiiiitttt to get to it! Though the bird bit will likely make me very sad. The pie reminds me of something I did. A few months ago I tried to make rye bread. It takes days. I took pics of what I did but after I baked it, it was terrible! I could have built the 3rd little pig's house with it. I was so upset after all that work that I didn't want to talk about it on my blog. On the bring side, my husband made me cinnamon rolls because he felt bad for me. So I know what you're saying. I'm neither an Oprah nor a Martha fan, so the mentions were a bit off-putting at first. But I appreciated how he tied it all together in the end, and I really enjoyed the book. Cooking is one of those areas where my inner critic goes into overdrive, to the point that (this is so dumb and embarrassing) when things go wrong with my cooking, I start crying and sometimes have panic attacks. Which is mainly due to my own perfectionism, and a lot of very bad cooking experiences, but I do have this idea that "real" cooks don't ever screw up. What a great review, Aarti! I like your discussion of how the appearance of effortless perfection is overrated. I don't even live in Chicago and I am miffed at the idea that the author knocks that city. I've always been fond of it from visits there. Now I have to read this book, it sounds amusing as all get out. Funny how he couldn't take a picture of his ruined pie at the time but can write about it later. Your "best life". I'm going to be happy if I muddle through the one I've ended up with. All I can say is life is too darn short for me to worry about my sheets being perfectly pressed or my pie crusts being perfectly fluted or any of the other Martha Stewart kind of stuff. Reading your commentary on the book makes me feel sorry for these guys. I can't imagine how exhausting it would be to try to keep up these appearances all the time. I'm happy to be less than perfect with a house that has a little dust here and there! Confession to make. I LOVE house redo memoirs so much. Now I really want to read this one. Might like it as much as a book I found a few years back for a quarter about two guys renovating a Southern manor house. Unfortunately lent it out and now can't remember the title. Sigh. It all started with House by Tracy Kidder. I really enjoyed reading your review of this book, which I'd seen elsewhere and had added it to my wishlist already. I enjoyed your approach to the book and what you got out of it. Lord knows I'm not a Martha Stewart type person. I'm a big fan of memoirs and this one sounds like a good match for me. ooh, this one looks interesting!! Cute cover!! rhapsody- Yes, I think it makes you sit back and consider the perfectionist approach! Literary Feline- I will have to check out Lisa's review. Andi- Yes, it WAS sad. But luckily, it was sad for the author, too. Chris- Oh, no! At least you got cinnamon rolls! That is some sort of silver lining. softdrink- Yes, I appreciated that, too. Apparently, the book was featured on Martha Stewart, which I find ironic. Jenny- Oh, no! I think I have panic attacks with cooking if I'm cooking a new recipe for a group of people, but not usually when it's just me. That's why I think it would be useful for people to say sometimes, "I overloaded the salt! Here's how I compensated." Christy- Well, you just won a permanent place in MY heart! Carrie K- Yes, I found that ironic, too, about the pie! Frances- Ooh, now I want to know about that book! Let me know if you remember the title. Jenners- Yes, I don't really do memoirs that often, but this one was really good! I don't know if I'd want to read his previous drag queen drug addict one, though. Carrie- Yes, it IS cute! Like many others, I loved the quote on how striving to perfection has become such a focus in many things. At first I thought that you meant that this book only covers the more perfect aspects of life as well and that made me unwilling to pick it up. However, I now understand it to reflect precisely on that attitude and therefore want to read it. I loved your review. Wow... this is among the most informative and insightful reviews I've recently come across! I really appreciate the time you've taken to share this book with us, Aarti. The Bucolic Plague has been on my to-read list ever since I saw it mentioned elsewhere on the web, but now I will be sure to track it down. irisonbooks- I am not sure what the book's "message" is in relation to perfection. I think the author and his partner don't pursue it so single-mindedly any more, but they still do have a picture-perfect blog with no "mistake" entries in it that I can see! But it's definitely a good conversation-starter. Laura- Well, thank you :-) I hope you read and enjoy it! I loved your review, but I decided I'd better give this a miss as soon as I realized it was written by someone who bought a rural mansion on a whim. Buy your mansion, man, but give it some thought! I've been a country mouse, (and wish I still were), so I'm a pretty hardened critic on the subject of country life.